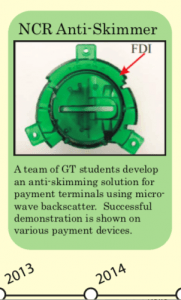 2014: A team of GT students develop an anti-skimming solution for payment terminals using micro- wave backscatter. Successful demonstration is shown on various payment devices. 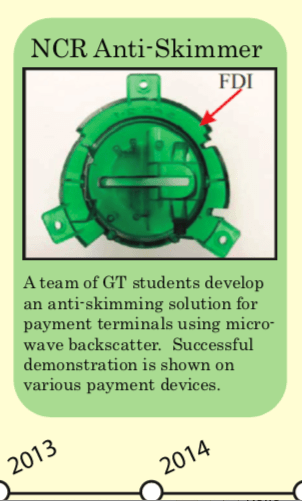 In this application of the 5.8 GHz backscatter system, a tag is placed near a card swipe machine in order to sense for the presence of foreign “skimming” electronics — devices that crooks put on payment terminals and ATMs to read card information from them. The system works by using a reader to sense the return amplitude and phase of the backscattered signal, which is static as long as the environment around the tag does not change. However, the introduction of even a thin nearby electronic wire will change this received amplitude and phase signature, which triggers an alarm. Fun fact 1: This work was tested at NCR headquarters in a giant room with over 100 different autonomous teller machines. Fun fact 2: A senior design team at Georgia Tech used the concept to make a through-wall museum alarm system. Their real-time demo at the senior design expo was a crowd pleaser, as a large wooden “T” was placed on a table while observers were invited to steal it without setting off the equipment (which was nowhere in site). The uniformed should consult the following Wikipedia page on Tech Tower.